On 31st October 2009, thousands of Muslims from up and down the country plan to converge in the heart of Central London in a spectacular procession to make their demands for the overthrow of the British establishment clear. become apparent that certain right-wing/anti-Islamic organisations had become intent on preventing the march from going ahead, using threats of physical violence, including bomb and death threats to any member of the Muslim community who happened to attend the march. Or something like that. 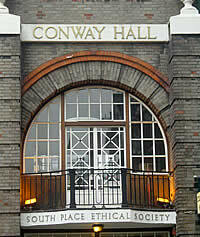 Last night I went to the Conway Hall Humanist Centre in London’s Red Lion Square for a meeting organised by the Central London Humanist group. So it was a bit of a surprise and actually quite alarming to arrive there on a hot summer evening and find a number of women shrouded from head to foot in black being shepherded upstairs by men who were dressed a good deal more comfortably.